A new Safedoors website is now live, featuring an online ordering facility for the full range of high quality GRP composite doors now available as part of Permadoor’s new dedicated retail offer. Visitors to www.safedoors.co.uk can access details of the extensive Safedoors range, together with information on side panels, top lights, finishes and glass and hardware options. The website features a special password-protected trade login area, where fabricators and installers can order online, using a door selector. Trade customers can also download order forms, price lists, literature, images and promotions for their own use. The website features details of Safedoors’ accreditations, which include Secured by Design and PAS23/24, as well as information on the doors’ environmental credentials, including U-values by door type. Safedoors is the new retail offer from Permadoor, the UK’s original composite door manufacturer, providing reliable, friendly service and a proven product range, all supported by the £multi-million Epwin Group. The Safedoors range offers 12 designs available in red, blue, green, white and black finishes, plus antique oak and rosewood woodgrain effects. All doors come complete with a full multipoint locking system and a choice of suited hardware including a knocker, letterplate, numerals and spyhole in gold, chrome, black, white or satin chrome finishes. Each door has a fully reinforced 70mm PVC-U outer frame, high insulation foam core, strong through-coloured GRP facings and slim, low line aluminium thresholds with twin seals. Part of the Epwin Group, an independent British business with substantial manufacturing and processing plants in the UK, Permadoor has a full suite of accreditations including ISO 9001(quality), ISO 14001 (environmental) and OHAS 18001 for health and safety. 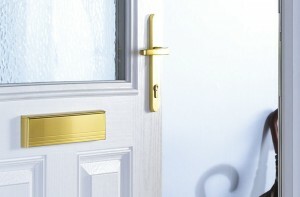 For further information, visit www.safedoors.co.uk.